...you seldom meet a knitter who likes to sew up garments. Me, I love it. I love the thrill of the finish (you may have noticed) so I like to sew up, it feels exciting. I didn't used to though until I used this technique. Work with the right side facing you. It makes sense doesn't it? you can see what your work will actually look like. I used to work the other side, sew really neatly then turn it out and hope it looked OK but it was mostly awful. See in the picture the vertical rows of stocking stitch? Ignore the knobbly edge and think about inserting your needle between the V's in the first good row. If you bury down you will see a little ladder underneath, put your needle under two of them, then draw the thread through. Pull thread and move your needle to the right hand side. Do the same. As you work side to side, the stocking stitch will meet up in the middle and appear seamless and flat. It is called matress stitch. If you have to incorporate a bit of ease because one piece is a bit longer than the other (yes it happens to me) Pick up one ladder on the short side and two ladders from the longer side and it will square up. If that has all just blown your mind and you want to see a video, here is a link to a really useful tutorial to help you along. Hope that is helpful for somebody. I am brimming with pride as I watched Big Sis put on HER scarf this morning. She finished it last night and was really proud of it. Yeah, it has a few knobbly bits in it but it is all hers. She wanted to sleep in it but for health and safety reasons I suggested she just snuggle up to it in bed! The yarn is called flutterby which is a very full chenille. Just popping in to show you a little table I decopatch covered for Little M. She had started to have a collection of objet d'art by her bed that was getting a bit of a trip hazard. I got this little box from the hall, dusted it (nearly), emptied it of candles and decopatched the top. The lid swivels to reveal a little hiding place for pens, notepads, barbie shoes, badges, hand written notes, stickers, party bag crap gifts etc. She is thrilled with it and it was done in an hour. I was thinking of painting it but her chest of drawers is an old 1940's pine set so it looked fine. Thanks for stopping by and always leaving such wonderful comments. Could I tempt you with a little look at my friends blog? she is a fellow yarn tangler who makes beautiful things. She is a very wonderful and giggly friend too! Time for a change I think with something easier on the eye. 'Live simply' is often a quote or phrase I see on my favourite blogs, I think this is one of the things that draws me to them. (sweeping statement alert) I think people who make things truly believe that they are using their time in a way that means they are living their life simply. When I saw this stitching kit on the Minerva website I knew I wanted one for our hideaway cabin. When we are there it feels like the essence of living simply. Also, I knew you guys would love it too. So this is my Minerva make for January. There were brilliant instructions and all the thread was already sorted onto a card. I used chain stitch, daisy stitch, french knots, stem stitch and back stitch all shown in picture tutorials in the instructions. A most enjoyable winter project. YUK! I can't wear it. Clara the dress stand can't wear it. In fact it is so unbalanced it can't even wear itself! That varigated yarn on a garment made in sections throws the hole thing out. Slope stripes, none matching stripes, curly border (steam blocked I might add) thick stripes, thin stripes - Eeeer, horrible. I tried to add a felt brooch but have you ever the heard the phrase, 'You can't polish a turd!' I love that phrase it makes me roar with laughter. So comment all you like, I will be going, 'DA,da,DA,Da' whilst holding my hands over my ears and laughing to myself. EDIT: You are all so lovely kind soulful people - I had crochet class tonight and a member offered to buy it off me she liked it so much! It was her birthday so I gave it to her as a present and said if she wanted to move the buttons, just have 3, wash it, block it again etc she was free to give it a new home. She was thrilled and so was I. I can go to bed happy now. 10pm Ahhhh. Hope you had a restful weekend. I don't use colour stranded yarn that often, I can never tell from the ball what it will look like as a finished fabric but I picked these up over a 2 years ago in a sale and after a tension square was not suitable for the pattern I had picked out...it had to be knitted into something. So I had to keep an eye on the colour stripes and keep changing between the two balls. I did manage to get the navy and burgundy strand as the starting colour run on every border piece but that was more hard work than luck. If you choose yarn like this or are lured into a bargain sale price as I was, I recommend you knit a top down or circular needle garment because the stripes are thicker on my front pieces than the back pieces because the rows on the fronts are, of course, shorter. It is a bit of a curler too. Steam blocking required for this yarn. I will have to start getting tough with it! Can I let on...I am not even sure I actually like it. I knit the two sleeves at the same time which I have never done before to try and get the yarn to match a little. I have had to start another ball to get two similar ones. Basically what I am saying folks is: don't buy curly weird King Cole Twist double knitting in orange and sale shop wisely my friends! Thank you for your lovely comments recently. has anyone else used this yarn? I had a great time the other night having a good old root around blogland, visiting blogs I had never been to before and generally looking for inspiration for my crochet classes which are starting again on Tuesday. I have a group I have been teaching for about a year now so I was looking for something a bit more advanced.. I found this great technique...a standing treble. A standing dc (US) or standing treble (UK) is a technique to join another colour without starting the round with a chain 3 which is a good disguise for a treble but always noticeable especially if you always make the ch3 in the same place. You get a kind of skinny line in your work where you start each round. Row 1: Make a slip ring. Dc12 stitches into the ring. Pull ring tight. Fasten off. Row 5: st tr, 1htr in the same place, 2htr in each stitch to make a border. Give this technique a try and let us know how you get on. I have leaped ahead somewhat and diverted my attention to the pillowcases.It started with a little collection of scraps. This is guerrilla patchwork at it's best, just sew them altogether in a strip. Don't worry about seam allowances and edges, just sew. Press it and then cut the edges straight. I found my rotary cutter did a tidy job. Then sew it to the edge of a pillow case pressing edges in and top stitching. Have you spotted the lovely crochet edge? well here is the pattern I made up for my crochet class which starts up again in mid January. First make a row of blanket stitch across the edge of your fabric where you want the edge to be attached to using embroidery thread for a different colour or your crochet cotton to match. Row 1: Join yarn in the first blanket stitch. Ch1, make 2dc in each blanket stitch to to the end. Add 1 more dc in the last stitch to make an odd number. Row:3 4ch, miss first 2 stitches, *1tr into next treble, 1ch, miss 1tr,* repeat from * to *. 1 tr in the last 3ch from the previous row. Turn. Row 4: 3ch, 1tr into the first ch space, *1tr into the next tr,1tr into the next ch space* repeat from * to * to end, turn. Row 5: Pointed edge as follows: ch1, 1dc in the first stitch, *miss 2tr, (3tr,3ch,3tr,) all in one stitch. Miss 2tr, 1dc*. Repeat to end. I will have a little lie down to try it out later! work first..bye.. 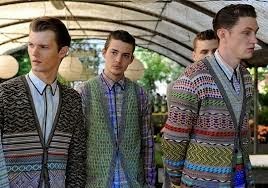 It is a summer knit really but isn't that how us knitters work? Make for summer in the winter and winter in the summer. I was certainly knitting earflap hats for the kids on the beach in August! The pattern was from Drops. It doesn't have a name yet. It is called 100-32. Not very inspiring but it it was just what I was looking for. I threw away an aged purple Monsoon cardigan this summer and needed a replacement. I wear a purple cardigian with so many of my dresses. Until I threw the old one away I didn't realise how much I missed it. The sleeves are bracelet length which is useful for work but a pain for putting a coat on but it will be Summer so no worries there. The yarn is Louisa Harding Jesse 100% Cotton. Fantastic quality and really improved my knitting tension. I think cotton knits better on metal straights than on my circular bamboo ones - but that might be just me. The yardage is small on these skeins - 89 metres for 50g so I used 8 skeins. It was in a sale but for me it was a princely sum but necessary to make this replacement garment. Two Skeins left over, mmm what will I make? My 6th All Done post where I show how a piece of crafty stash has all been used up and is no longer using drawer space. Every time I sat at the sewing machine in the holidays, both of the girls said "Can I have a go?" I relented and said yes every time which meant I didn't do as much of my quilt as I wanted but they both loved making their skirts. Big Sis is very good on the machine. She gets a good speed going. Little M is a little bit more reckless and feels the need for speed! I truly could not take a photo of her; someone would have lost a hand! The fabric is a piece about 1m that I have had since 1993. I was glad she liked it because it was too out of fashion for me to wear. Once the minions had got bored and wondered off elsewhere I got down to some intermediate sewing with this pinafore to use up the red remnants and the last of my jeans fabric. Back to work tomorrow but I will be glad of the rest. I have enjoyed reading and ogling so many of your year end reviews this week. The colour, talent, fun and creativity is truly inspiring. I really can't do one of my own, I just make too much random stuff to make a stylish mosaic but I would like to record and share my crafting resolutions for 2015..Looking forward shall we say? 1. I want to crochet a skirt and have done for a long time. 2. I want to knit something for my bloke that is not a hat. This is just to frighten him because he reads this blog!!! 3. 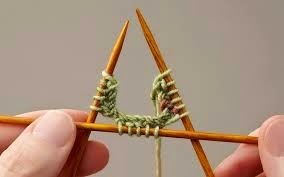 I would like to finally master using double pointed needles. 4. I want to set a time target for my double bed quilt. I am one of those people for whom resolutions stick around, they make me change my behaviour for a long time. Here are some of the New Years Resolutions that I have enjoyed in the past which have continued to influence my life. So do you make new years resolutions? Do they work for you?